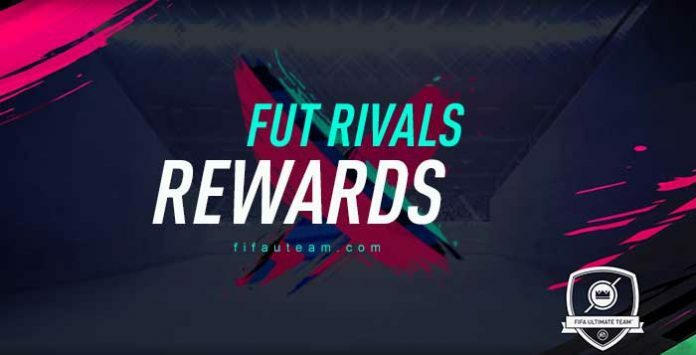 Are you looking for FUT Rivals Rewards on FIFA 19? You are in the right place. We publish in this page all the prizes you can earn in this FUT game mode, and we keep it updated throughout the year. As you know, FUT Division Rivals is an all-new online player mode (an extensive guide about it can be found clicking here). It features 10 divisions, each one with five ranks. Each week in Division Rivals is an entirely different competition. You get promoted or relegated depending on how much skill rating you acquired throughout the week and you can earn rewards at the end of it. Obviously, the higher is your division, the better are the rewards too. Your weekly score determines your rank within the Division, and a higher rank means a better choice of rewards when the competition ends. Let’s find out the FUT Rivals Rewards for FIFA 19. Starting with the competition that begins on March 28, there are new division rivals skill rating requirements. When will you receive your FUT Rivals rewards? FUT Division Rivals is a game mode within FIFA 19 Ultimate Team that rewards the online players with decent prizes. This page is your only stop for FIFA 19 FUT Rivals rewards. The rewards are delivered every week, ten minutes after the event ends. Except if you specifically choose untradeable cards, you can sell them in the transfer market if you wish. You don’t need to open the packs in the week they are assigned to you. They can be stored to be opened later. They don’t expire. It’s important to notice that the FUT Rivals rewards are dynamic and will change on a consistent basis. In other words, new rewards will be assigned every week. Since it’s impossible to publish them all in this page, we will list as many rewards as possible for each division/rank. I can’t explain how better this option is, just opened D6 rank 1 rewards and the best player is Christiansen. I will be lucky to sell everything for 15k and I could take 52k instead. Yes, taking coins is almost always the best option. Why arent there any estimate of how many points i need in division 2, rank 1? The reward for effort gets so damn worse the more you level up, Division 6 seems like the best division to be in. Cant progress because players are quiting when i win, and i dont get the points. Did I missed something? How is it possible? Yes, this is correct. You always receive the rewards of the division in which you started the week. hello, there is a mistake i think in division 7 rewards, i am in division 7 and getting the rewards same as you listed for division 6. Hi. First of all, thank you for your comment. We believe the rewards published on this page are right but after your alert, we need to double check them. Maybe you started the week on division 6 but you were relegated to division 7 at the middle of the week. The rewards are the ones from the division in which you have started the campaign. Do you think it may have happened? On Thursday when the division reset where you in division 6? Even if you progress a division during the cycle you will get the rewards for the division that you initially started when the rewards are dished out on a thursday. You mean 35,000 coins + 1 mega pack on div 6 rank 3, right? My rewards for division 5 rank 1 are 42k coins not 58 and theirs no mega pack I’m on pc. Div 4 rank 1 rewards are woth more than div 3 & 2, how’s that logical? Pick the coins, that’s our advice. Thank you very much. We didn’t notice that because it’s the only untradeable reward which isn’t the double of the tradeable option. We believe that is a mistake. We already updated the page. Once again: thx. No problem, I made the same mistake when I picked my rewards. Such a dirty trick from EA, but yeah nothing you could to about it. Div 6, rank 1 is wrong i think, should be 2x for untradeable. On a sidenote though, hello again Rodrigo! I remember first coming to comment on one of these in FUT 15 or 16 (?) and I remember Falcao was listed as one of the best strikers in FUT haha! Keep it up Rodrigo, these are always a great help! Good old times. Maybe he will get a Flashback card, who knows? Yes, it was wrong. Already fixed. Thank you. Hi level 3- did not get to choose rare player pack. Only given mega pack choices. That’s because you typed this message at 7:15am and the rewards only go out at 7:55am (UK time) like it is published in this page. can u update the rewards now that the bug is fixed? Olá Afonso. We already updated the rewards for some divisions (3, 4, 5 and 6) now that the issue was addressed. However, we are asking the community to check the rewards of other divisions. If you receive anything different from the rewards published on this page, please report us in the comments. Threshold for ranks is not fix? Does it increase until certain amount per day? Each rank has a fixed % participants. Most of the cases it is 10%. It means that the number of points is always growing up because there are always people playing and getting more points. It works just like Squad Battles. I think this reward list is wrong, For example division 5 rank 1 is way much better then division 1 rank 1. Will you update list, when this week Division Rivals period will finish ? 1) Almost anyone realized yet, but the rewards are dynamic. They will change (almost) every week. 2) The division 1 rewards were taken from week 1 (sep 20 to sep 27). It means that the list is not wrong but I understand your point. To avoid misunderstandings, we have removed division 1 rewards from this page until new ones are assigned. I believe all other rewards make sense to you. We will update this list every time the rewards suffer big changes. Does the threshold for ranks refresh like in squad battles? Every week (from thursday to thursday) is a new competition. We expect to update them in the coming days. Hey, i know the information we got at this point is limited, but i can’t see any sense in that the reward for finish second highest rank, is way better than the reward for finishing the highest rank? Acho que a quantidade de jogos e os pts de habilidades vão definir o RANK dentro de cada divisão, pelo menos foi o que eu conclui. Hey, i totally agree with you.. i also saw it when people uploaded it from the beta.. it makes no sense. Also if you need 1200 point for the weekend League, its gonna be hard to get that amount if you only get that low championship points. We agree with you. Obviously, they will fix it in the final version. At this moment, all we can do is to share the FUT Rivals rewards from the two divisions available on the beta.